Vice-Admiral Mark Norman makes his way to the courthouse in Ottawa, on Jan. 30, 2019. 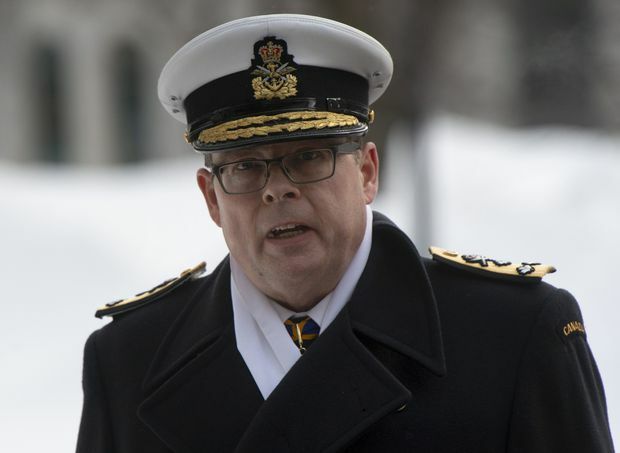 Vice-Admiral Mark Norman’s defence lawyer alleged in an Ottawa court that Crown prosecutors have been discussing trial strategy with the Privy Council Office, calling the Crown’s actions more concerning than political interference in the criminal prosecution of SNC-Lavalin. Ms. Mainville said the Crown’s position is “more concerning” than the allegations relating to SNC-Lavalin because the Crown dealt directly with the Privy Council Office. The Globe and Mail reported on Thursday that former attorney-general and Justice minister Jody Wilson-Raybould had resisted pressure from the Prime Minister’s Office to issue a directive to the Public Prosecution Service of Canada to stay court proceedings against the engineering giant SNC-Lavalin Group Inc. in favour of a negotiated settlement without trial. The pretrial hearing of Vice-Adm. Norman’s breach of trust charge resumed on Monday with Ms. Mainville seeking to obtain unredacted notes from meetings between Crown prosecutors and officials at the Privy Council Office. “We maintain that discussions about how to run the trial are protected by litigation privilege,” Ms. Mercier wrote in the e-mail sent on Friday. In the pretrial hearing on Monday, Ms. Mainville said, “The prosecution should not be discussing trial strategy with the Prime Minister’s Office’s right-hand person,” referring to the Privy Council Office, which is the department that assists the Prime Minister’s Office and which also launched the investigation that led to Vice-Adm. Norman being charged. Vice-Adm. Norman was suspended as the military’s second-in-command on Jan. 16, 2017, and charged last year with breach of trust for allegedly leaking government secrets in an attempt to influence cabinet’s decision on a $700-million shipbuilding contract with Quebec’s Davie shipyard. He has denied any wrongdoing. “By all appearances, this is a more direct influencing of the prosecution. The attorney-general is entirely bypassed. The Prime Minister’s Office, via its right arm the PCO, is dealing directly with the Public Prosecution Service of Canada. And the prosecution service is allowing this to happen," Ms. Mainville said. The Crown is expected to respond in court on Friday and has been ordered to provide an unredacted and sealed version of the notes to the judge. Outside the courthouse on Monday, Ms. Mainville told reporters that it’s “extremely important for the prosecuting Crown to be entirely independent of political interference." Ms. Mainville said the way this case is different from the SNC-Lavalin case is that SNC sought help from political institutions; Vice-Adm. Norman did not. Vice-Adm. Norman told reporters that he is confident in his team and in the court to make the right decision.